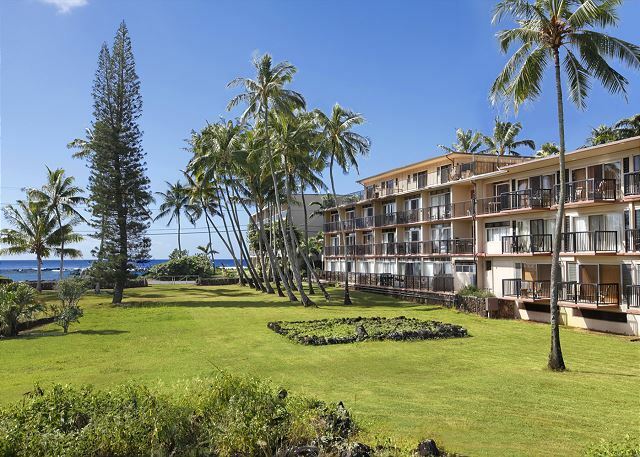 Kauai Prince Kuhio 106 is a gorgeous ground-level, one bedroom condo with ocean views, custom mahogany cabinetry & furniture. From your private porch, enjoy the serene sounds of rolling ocean waves, tropical song birds and palm fronds rustling in the trade winds. With direct access to a pool, the beach and town, all of your paradise desires will be easily satisfied. Older couple always stay at the PK. 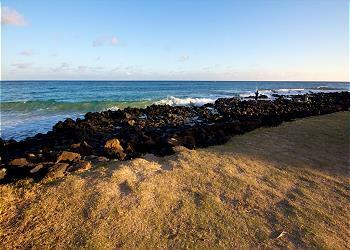 Great location in Poipu. Unit was clean, bug free & bed was firm/ comfortable. Living room faces PK park with nice view & breeze. These are “basic” units, but a much better value than most properties. Kitchen could use a little updating. Great location , great unit, good pool, we had a great stay. The condo 106 has a good view on the ocean from the rear balcony. However it was a little bit noisy because the entry is right in front of the parking lot and beside the management office. We had good help from the office manager. 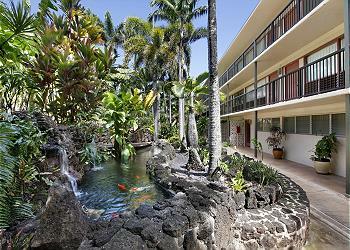 Conveniently located to go the Waimea canyon and close to the Lihue airport. 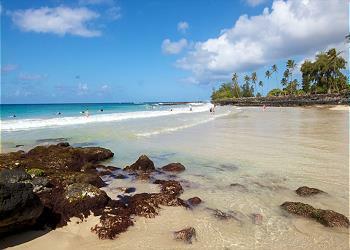 Walking distance to a small beach where we could do good snorkeling. 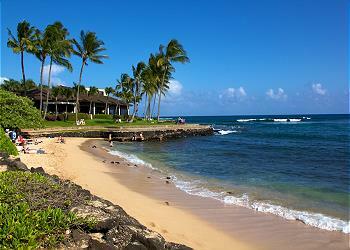 We were in a Kauai for a wedding, the location of the wedding was right across the street a Beaches. The place was easy to find and get in and out with the code. It had all the good qualities kitchen gadgets one can think of, even a blender to make smoothies with. Beach towels and beach chairs. Good for a couple or a family with the small child to hear if needed in the other room. 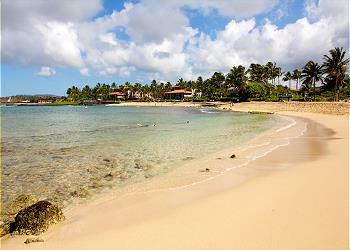 Great place to stay near Poipu! Very convinient location and nice grill with pool area. Family had a great time, really close to poipu beach. Beautiful place close the beach where you can enjoy magnificent sunsets just across the street. Immediate response when checking in which was very helpful and friendly, would recommend this location to others! 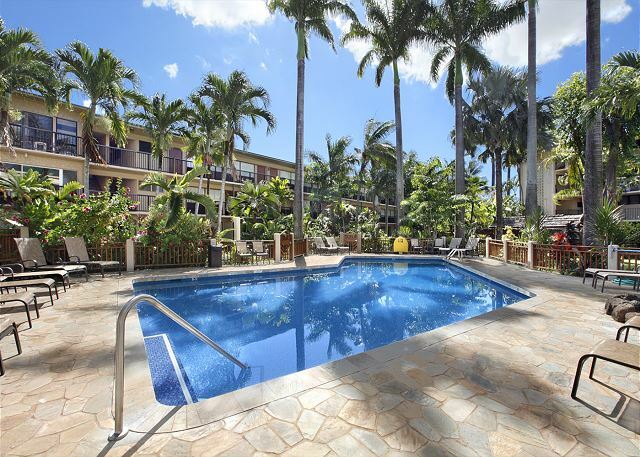 Well appointed, very clean, quiet, view of ocean and park, great pool, comfortable, centrally located. Great location. Loud birds early in the morning around 5am. Loud refrigerator. Amazing place we want to keep it a secret! Great location , all the amenities there! Definitely want to stay here again! A very peaceful and apart from the morning roosters a very quiet place. Helpful management and staff. 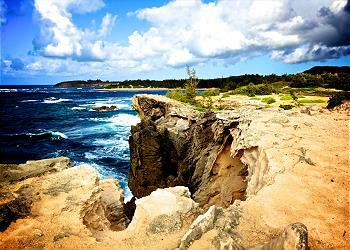 Just steps away from the best sunset beach and good snorkeling, close to Spouting Horn and the botanical gardens. Great Location on South end of island. This is a nice place to stay on south end of island. The price is lower than other places but is inline with the age of the building and condition of the unit. The unit is clean but not a lot of updates. The pool and area around courtyard are very nice. Accommodation is situated in an excellent location and the overall property is well maintained. The condo is clean and comfortable and is reasonbly well equipped with beach towels, chairs, umbrella etc. It has a nice pool and good internet, however the unit could use some updating. Would consider this very good budget accommodation. Management was very responsive to questions. We lived Prince Kuhio condo in Poipu! Our week was excellent. 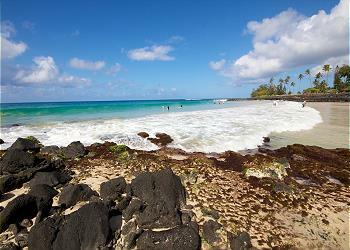 Location is superb...great beach, fine snorkeling, outstanding places to take long liesurely walks, Beach House restaurant across Lawai Rd is wonderful for food and watching surfers. Unit 139 has everything, and is so comfortable. Loved every minute, including the twice-a-day parakeet events! Being adjacent to Prince Kuhio Park makes sitting on the patio watching the ocean a true joy. Perfect location that met all our needs! I visited Kauai during the rainy season and wanted to stay in a sunnier spot on the island with an ocean view and easy access to swimmable beaches. Prince Kuhio 106 fit the bill! I loved drinking coffee on the lanai and watching the sunrise over the ocean every morning. Swimming/snorkeling across the street was nice on days I didn't feel like driving elsewhere. Spouting Horn is also a nice walk from the condo. Having a full kitchen to cook meals in was convenient. Also, the Beach House restaurant across the street has great cocktails for happy hour and I loved the Koloa Fish Market for picnic lunches. Customer service was great from booking the property to checking out. I would definitely recommend this property to anyone and look forward to visiting again! Very satisfactory: kitchen could use some updating, but still very functional. Loved that snorkeling was just a quick walk down to the beach. On-site property manager very helpful / approachable. Could use a little more direction for recycling. We really enjoyed our stay here. Everything we needed, including beach mats, umbrella and deck chairs. Comfy bed and well equipped kitchen including spice selection. Nice breeze through the property and can hear the sound of the waves which was really relaxing. Did get woken up by the Roosters but think this happens throughout most of Kauai. Great place to stay with easy access to other parts of the Island. We hire a car so really easy to get about. would definitely stay here again. Overall we had a great stay. The unit is in a great location and within walking distance to beaches, restaurants, and shopping. It also has nice view of the ocean from the first floor lanai. The unit is in good shape, and although not new by any means, has all the necessary items including a well-stocked kitchen and beach supplies (chairs, cooler, etc.). Trade winds kept the unit cool. The owners were easy to work with and responded quickly to all our inquiries. We would definitely stay here again.